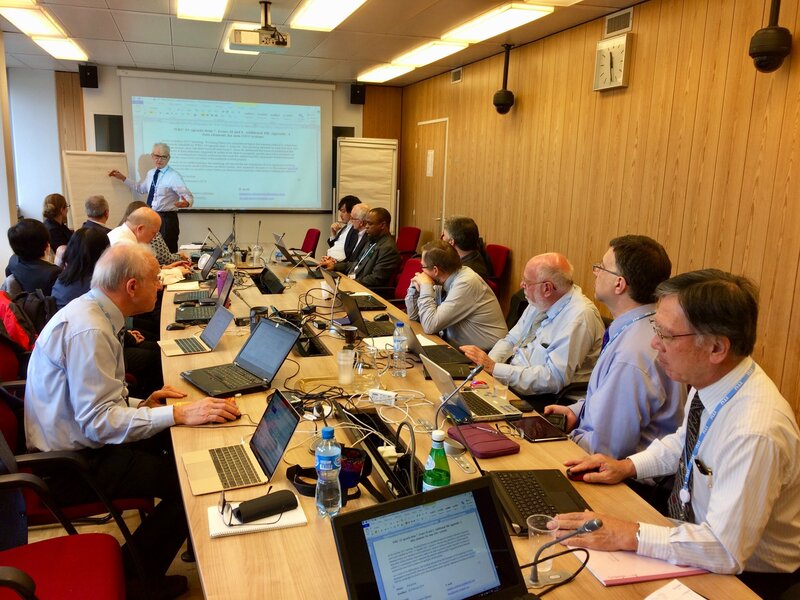 Bryan Rawlings, VE3QN, RAC Special Advisor, is in Geneva, Switzerland attending Preparatory Meetings for the 2019 World Radiocommunication Conference (WRC-19) until Friday, November 17. The current meetings are the fourth of a series of meetings which will continue until just before WRC-19 now scheduled to be held from October 28 to November 22, 2019. Preparatory Meetings are usually held at the International Telecommunication Union (ITU) headquarters in Geneva and are usually of two weeks duration. This time Bryan is attending as a member of the Canadian Delegation and also as an Expert Consultant for the International Amateur Radio Union (IARU). Preparatory Meetings primarily prepare documents on the agenda items identified for the upcoming WRC. They are in turn preceded by meetings and the submission of documents from the participating administrations, for example, Canada through its authorized government agency, the Department of Innovation, Science and Economic Development (ISED; formerly Industry Canada). The RAC representative is made a member of the delegation by invitation and Bryan’s role is to advise on Amateur issues. The principal Amateur Radio issue is an international authorization of the 50 to 54 MHz band in ITU Region 1 (Europe, Africa and the Middle East). Canada has submitted a contribution to this meeting indicating no concerns about interference to the Canadian users who are, of course, Radio Amateurs since 50 – 54 MHz is a Primary Allocation in Canada. Indeed, Canadian Amateurs would welcome harmonization of the six-metre band worldwide. ITU-R Working Party 5A is chaired by Dr. José Costa, a Canadian, and the Canadian Delegation to WP-5A is being chaired by Ms. Cindy-Lee Cook of ISED. In addition to Canada, there are Amateur delegates in Geneva this time representing their individual delegations and/or the IARU and they come from the United States, the Netherlands, the United Kingdom, Germany, Japan, Norway, Brazil and Australia. These meetings are also debating an expansion of the frequencies, powers and deployment of Radio Local Area Networks (RLANs) in the 5 GHz range. Canadian Amateurs have a secondary allocation here in 5650 to 5925 MHz which we already share with the Primary Users – principally meteorological radars – and with ISM (Wi-Fi, etc.). Also warranting close attention is an agenda item proposing frequencies for wireless power transfer, e.g., charging cellphones and – significantly – larger devices including vehicles. Frequencies under discussion lie in the range 19 to 300 kHz and – possibly – just below the 40m Amateur band. Depending upon the frequencies planned and the technical characteristics there may be significant interference issues to users of the HF and VHF spectrum. The World Radiocommunication Conference (WRC) held in Geneva during November 2015 has recommended an agenda for the next WRC, to be held in 2019, to the Council of the International Telecommunication Union (ITU). One of the agenda items is of particular interest to the small-satellite community. One of the factors that the conference considered in deciding on these particular frequency ranges was “that some non-amateur satellites have used frequencies for telemetry, tracking and command in the frequency bands 144-146 MHz and 435-438 MHz which are allocated to the amateur-satellite service, and that such use is not in accordance with Nos. 1.56 and 1.57.” Those two provisions of the ITU Radio Regulations define the amateur and amateur-satellite services respectively. The ARRL reports International Amateur Radio Union (IARU) representatives were in Prague earlier this month to join discussions on the regulatory aspects of orbits and spectrum usage for nanosatellites and picosatellites. More than 160 participants from some 40 countries attended the symposium. The gathering is being considered an important step in preparing for the 2015 World Radiocommunication Conference (WRC-15) in Geneva November 2-27. Delegates discussed challenges facing small satellite development, including aspects related to national and international legal and regulatory issues, frequency management, and radiocommunication standardization. Participants reiterated the need to ensure the long-term sustainability of small satellites in outer space. They stressed the importance of implementing national regulatory frameworks that clearly define the rights and obligations of all stakeholders, in conformance with international laws, regulations, and procedures established by the UN General Assembly, the United Nations Committee on the Peaceful Uses of Outer Space, and the and ITU. ITU Radiocommunication Bureau Director François Rancy, said the ITU, in partnership with key players, including academe, “is addressing newly emerging requirements by various industry sectors to place small communication satellite systems in orbit. “We are examining the regulatory aspects of the use of radio frequency spectrum and satellite orbits to facilitate the launch and operation of a new generation of small satellites,” he said. The symposium was organized by ITU in cooperation with ITU Academia Member, the Czech Technical University’s Faculty of Electrical Engineering (CTU FEE). IARU Region 1 has released issue 65 of the VHF-UHF-uW newsletter, it covers WRC-15 which could affect a number of amateur radio bands. The newsletter says agenda items at the ITU World Radiocommunication Conference includes topics that affect amateurs in the 5MHz, 5GHz, 10GHz, 24GHz and 77GHz bands. There may be a need to raise the option of a new allocation such as 1300-1310 MHz in order to mitigate restrictions that are appearing in the existing 23cm band. The ARRL report the the USA is to propose the use of 9.9-10.5 GHz for the Earth Exploration Satellite Service. US proposal for World Radiocommunication Conference 2015 (WRC-15) Agenda Item 1.12 — to expand the Earth Exploration Satellite Service (EESS) in the vicinity of 10 GHz — supports allocating an additional 600 MHz of spectrum to the EESS (active) as a primary allocation in the frequency band 9.9-10.5 GHz, with certain limitations. The Amateur and Amateur-Satellite services have secondary allocations of 10.0-10.5 GHz and 10.45-10.5 GHz, respectively; the only current primary allocation is to Radiolocation. A study conducted by a Working Party of the International Telecommunication Union Radiocommunication Sector (ITU-R) concluded that the interference potential of EESS (active) to Amateur Radio was limited to very brief and infrequent periods. “In this hotly contested frequency range, the best we can hope for is that sharing partners will be compatible with continued amateur access, and that is the case here,” ARRL CEO David Sumner, K1ZZ, commented. EESS use of the 9900-10,500 MHz band would be limited to systems requiring necessary bandwidths greater than 600 MHz that cannot be fully accommodated within the 9300–9900 MHz band.